Maestro Gibson has worked with many professional musicians and young musicians who are destined to become professtional. One of the very special young musicians is Stephen Waarts. Please read about him below and watch the video of Stephen playing the Tchaikovsky Violin Concerto with the Silicon Valley Symphony. Stephen Waarts, age 12, is a seventh grader at the School for Independent Learners in Los Altos. 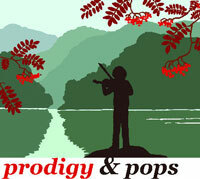 His musical interests include violin, piano and chamber music. 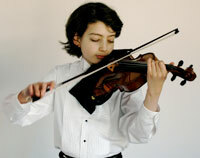 He began his violin studies at age 5 and piano studies at age 8. Since May 2005 his violin teacher is Li Lin, a faculty member of the San Francisco Conservatory of Music, Preparatory Division. His previous violin teachers include Krishnabai Lewis and Jenny Rudin of Notre Dame de Namur University. His current piano teacher is Irina Sharogradski, a former professor at Rimsky-Korsakov Music College in St. Petersburg. His previous piano teacher is Steven Lightburn. Recent 2008/2007 violin awards include the grand prize in the 2008 Mondavi Center Third Annual Young Artists Competition, grades 4-8, first place in the 2008 Young Artist Competition of Diablo Symphony Orchestra, ages until 22, winner of Margaret Brady Study Grant in the 2008 Stewart Brady Competition for strings, ages 10-20, first place winner in the Junior Strings Category of the 2007 MTAC VOCE California State Competition, ages 12 and under, winner of the Taghioff Prize (first place) of 2007 Fremont Symphony Young Artist Competition, ages under 16, winner (first place) of the 2007 Menuhin - Dowling Young Musicians’ String Competition, ages 9-11, and first place violin winner of the 2007 CMTANC Youth Music Competition, ages 8-10. In May 9, 11, 2008, Stephen performed Wieniawski Concerto No. 1 with Diablo Symphony Orchestra, with their Music Director Joyce Johnson Hamilton conducting. In April 20, 2008, Stephen performed Paganini Concerto No. 1 with Saratoga Symphony, with their Music Director Dr. Jason Klein conducting. Stephen performed and was interviewed in Capital Public Radio "Insight" in March 2008, and has had two TV solo appearances in “Focus on the Arts” on Peninsula Television in 2006 and 2007. He was also selected to perform in the 2007 Junior Bach Festival and played in the master class given by Baroque Violinist Elizabeth Blumenstock as part of the 2008 Festival. Stephen participated as violinist in Music at Menlo 2006 and 2007 Summer Institutes, and is looking forward to participating in the 2008 Institute. In 2004 he participated in Soesterberg International Music Festival in Soesterberg, Netherlands and was chosen to play in the Festival Showcase recital. In piano, Stephen was awarded Honorable Mention in the 2007-2008 CAPMT Bartok and Contemporary Music Festival in the San Francisco Bay Area District, Intermediate A (ages 6-13), and was also selected to perform on piano in the Piano Theme Recital in the 2007 MTAC Convention. Other honors include a 2007 Honor Roll of Distinction Award (for students who score in approximately the top 1%) in the American Mathematics Contest 8 (AMC 8, for grades 8th and younger), a 2007 Gold Olympiad Logo Pin (for top 2%) in the Math Olympiads for grades 7th and 8th, and being selected as 2008 January Student Master Artist of the month in KidsArt, Los Altos. Watch the video of his performance of the Tchaikovsky Violin Concerto with SVS on November 15, 2008. © Copyright 2009 BACH to Music All rights reserved.